Filling the vacuum created by the US withdrawal from Syria — if it ever happens — has emerged as a new problem. A delegation from Turkey on Saturday went to Moscow to discuss this particular issue and many others pertaining to the Syrian crisis. It was composed of the most directly interested persons in the Syrian crisis: Foreign Minister Mevlut Cavusoglu, Defense Minister Hulusi Akar, Head of the National Intelligence Organization Hakan Fidan, and presidential spokesperson Ibrahim Kalin. What the Turkish and Russian foreign ministers said to the media after the meeting did not go beyond standard statements — such as that they agreed to fight all sorts of terrorism in Syria and coordinate their military moves. For Turkey, fighting terrorism primarily means the elimination of the Kurdish fighters of the People’s Protection Units (YPG), while for Russia it means the fight against Daesh. They also reconfirmed their support for Syria’s territorial integrity, which for Turkey means territorial integrity under a unitary state structure, while for Russia it means integrity under a federative structure. The Moscow meeting was preceded by unconfirmed reports that the YPG’s political branch, the Democratic Union Party (PYD), had agreed to transfer power to the government in the northern Syrian district of Manbij. This news angered Turkey but was received with satisfaction by Russia. Turkey is fiercely opposed to the emergence of any sort of Kurdish entity in the region because it believes that, once set in motion, the evolution of Kurdish autonomy cannot be contained. This is why Turkey wants to expel the YPG fighters from the east of the Euphrates and set up an administration that will reflect the original ethnic composition of the area, as it was before the Syrian crisis broke out. The other important actors’ policies are as follows. Russia is in favor of the extension of the Syrian government’s control to the entire country, but is also in favor of increased competences devolved to the municipalities of the areas inhabited by the Kurdish majority. Russia has the means of achieving this on its own, but it wants to do so without antagonizing Ankara. Moscow does not want to spoil its warming relations with Turkey. Turkey is fiercely opposed to the emergence of any sort of Kurdish entity in the region because it believes that, once set in motion, the evolution of Kurdish autonomy cannot be contained. Russian Foreign Ministry spokesperson Maria Zakharova explained the Russian position on this subject by saying “the areas vacated by the US forces have to go back to the Syrian government,” adding that: “Russia and Turkey are working in close cooperation both on political matters and in the fight against terror.” This statement and the flag-showing exercise of the Syrian government in Manbij indicate that Turkey and Russia are heading toward a tough bargaining on this subject. Iran is also in favor of extending the Syrian government’s control over its territory, but its position differs from that of Russia because, like Turkey, it is also opposed to the emergence of a Kurdish entity. The US cooperated with the YPG fighters during the anti-Daesh fight because they proved to be a reliable and efficient partner. Therefore, Washington supplied them with huge quantities of military equipment, weapons and ammunition. But, because of Turkey’s capacity to render valuable services to NATO in the strategically important location that it occupies, Washington — or President Donald Trump — chose not to oppose Turkey carrying out the military operation it was contemplating east of the Euphrates. Nonetheless, the US will probably continue to support the Kurds one way or another, as we can see in the statements by several high-ranking officials in the Pentagon, State Department and the White House. Hezbollah will probably help the Syrian government settle in the sites to be vacated by the US troops because it has to follow the Iranian policy line. Israel is also an important actor in Syria. So far, its interventions have been confined to preventing the spread of Iran’s influence. It has avoided, to the largest extent possible, attacking targets that are exclusively Syrian. But now the scope of its intervention may extend to protecting the Kurds or preventing their elimination. France, another actor in the region, though limited to just 200 troops, is also opposed to Turkey’s military action. It may try to impede or dilute any Turkish military action against the Kurds in the region. In light of the high number of parameters opposing Turkey’s policy, and bearing in mind that Turkey says its main aim is to restore the pre-crisis ethnic composition of the region, this could be achieved without resorting to the military operation — if the international community supports Turkey in enforcing this policy. 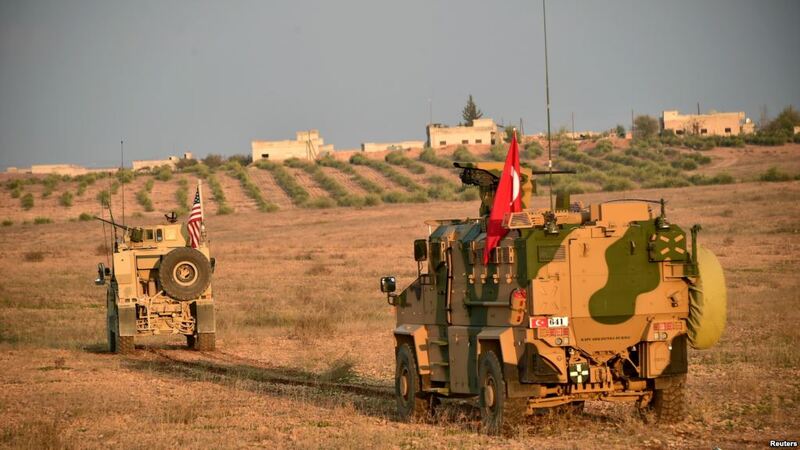 Such an approach would eliminate the risk of unavoidable casualties that both Turkey and the Kurds would suffer in the case of a military clash, contribute to the normalization of Turkish-Syrian ties, and accelerate the democratization process in Syria.